Unlike faucets of old that come in a uniform generic design, manufacturers today have deemed that it pays to be unique, especially with tap designs that blend in with its background. That’s the reason why there are literally more than a thousand bathroom tap designs available for every conceivable bathroom motif ever conceived of. The current wave of interior designers favor the chrome look, as seen in most lifestyle magazines and home equipment catalogues today, because it complements white tiles perfectly. That’s why I spared no expense when I had my bathroom constructed. Apart from covering everything in luxurious white tiles, forming a suitable motif and installing appropriate fixtures, I also purchased high quality toilet bowls and components for my shower set up, not to mention Kohler sinks and high quality bathroom taps. Individually they look stunning, but together, they’re nothing short of a masterpiece. I’m a practical woman so I didn’t just go ask the salesperson in the hardware store to give me the most bought or expensive set of bathroom taps they have. Before going to the hardware store, I did some research on the internet about good bathroom tap brands and models that both experts and critics recommend and abhor. I didn’t let them influence my decision but I took their advice to form an ideal purchase. 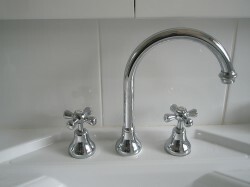 There is of course no right or wrong choice when choosing bathroom taps for your bathroom. There is, however, an appropriate choice, especially when put against others that would make your bathroom look blatantly ridiculous. When I chose my bathroom taps, I picked the model with the best balance between aesthetic appeal and functionality. I have to admit that it has become increasingly hard to choose good bathroom taps because, like I have said, bathroom taps have gone a long way. You can be sure, though, that the improvement has gone beyond just the aesthetic. Manufacturers have also improved some functional aspects of bathroom taps, making it possible for everyone to control the type of water flow, extend the spout of the tap, or even (my personal favorite) enjoy a light color effect with the water being dispensed, among other things. I actually have to constantly remind myself that I’m not in a luxury hotel room somewhere in Europe when spending more than a few minutes in my bathroom. When picking a model that would blend in with the predominant theme in your bathroom, keep in mind the features you wanted your bathroom taps to have. You will eventually have to give up some of your standards to meet aesthetic and functional requirements and eventually come up with a decision. So for all those who own white-tiled washrooms, try the Kohler K-11000-0 Bol Ceramic Faucet and find out what I mean about all the bathroom elements blending in. There’s always room for a cool change and there’s no better time than now.